The core of this deck has been largely unchanged for many years now. The idea is that you get to play the highest density of fast mana of any deck in the format. In addition to Moxen, Black Lotus, Sol Ring, and the like, you also gain access to Ancient Tomb and Mishra's Workshop, as well as the most powerful Tolarian Academy in the format. You also get to use cards like Sphere of Resistance, Chalice of the Void, and Trinisphere to make the fast mana asymmetric. It turns out that Moxen and other cards that make more mana than they cost are even better when you get to have them and your opponent doesn’t. The big difference over the last couple of years has been that more powerful artifact creatures have been printed, allowing the deck to transition from a lockdown deck to a more aggressive deck. 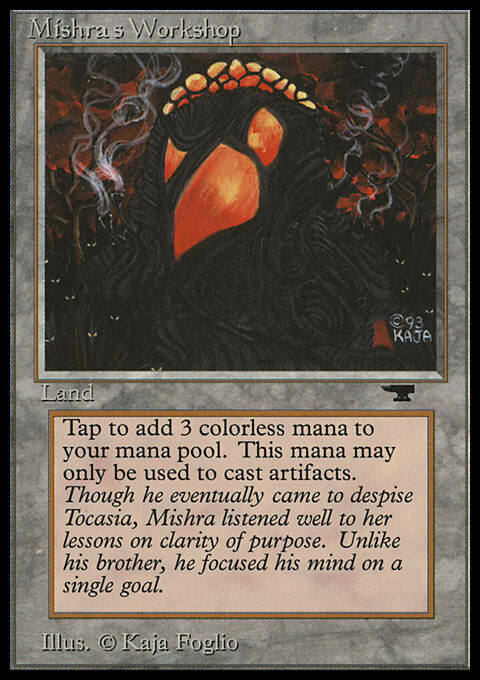 You don’t see nearly as many copies of Tangle Wire, Smokestack, Crucible of Worlds, and Uba Mask as you once did. Instead, you have a cohesive beatdown shell, featuring Foundry Inspector to help you get on the board quickly, as well as Hangarback Walker, Walking Ballista, and Steel Overseer. These cards team up to function as both mana sinks and synergistic engines that give you both aggressive pressure and resiliency to spot removal, sweepers, targeted removal, and reach. When you combine this kind of powerful, flexible gameplan with the fact that, on the play, you can easily string together enough prison pieces to stop your opponent from ever casting a meaningful spell, you’ve got the recipe for a top tier deck.